Birthdays are an important moment where you get to celebrate reaching a crucial milestone in your life. It is during your birthday that you get to celebrate the special day you were born. Adding an extra year to your life is one of the greatest blessings you can get. You get a chance to start afresh or fulfill a mission you want to achieve. One does need to worry about the happenings of the past year but focus on rebuilding their lives once again. Growth is also essential in anyone’s life. An extra year in your life is a symbol of growth. It is important to celebrate your birthday rather than just sit down and let the day pass. This is not just another ordinary day but a time to give thanks for such a great opportunity in life. You should celebrate your birthday in the best way possible. Invite family, friends or anybody to be part of the commemoration. Seeing nations celebrate their birthdays popularly known as independence days should help you understand the importance of celebrating a birthday. It is during this period that you receive gifts from friends to encourage you to soldier on with the new endeavors. There are many ways you can celebrate your birthday. You can hold a party and invite family or friends. One can also do meaningful things like giving back to the society. Go out, celebrate and share with the less fortunate in the society. Such acts of kindness can help depict how thankful you are on your big day. Birthday wishes are there to encourage you on your special day. They are usually written on greeting cards or small notes. Some may send them to you as mobile phone messages or social media posts. Turning 40 is one great milestone one can achieve in life. It is the age where you have to reflect on how well you have lived your life and plan better for your future and that of your children. You should mark this big day by celebrating it properly. Coming up with the exact right words to send someone on their 40th birthday may not be easy as you think. However, we are here to help you come up with the best messages you can send someone celebrating their 40th birthday. I always count myself lucky for having such a great mother. May you live many more years and continue being a great mother. 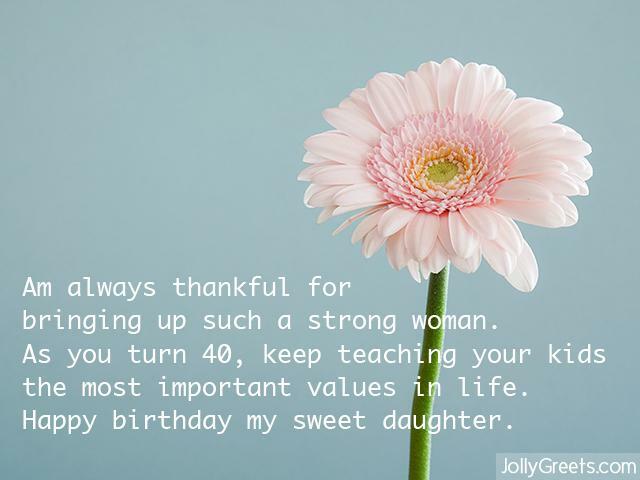 Happy 40th birthday mum. Happy 40th birthday to the most beautiful woman in the world. Thank you for being there for me in good and bad times. May you live to blow many more candles. The past 39 years have been great having you as my mum. You have shown me the way, taught me how to be a responsible person and respect others. I am always grateful to have a mother like you. Happy birthday, mom. The best part about you turning 40 is that you are getting younger. You are the best mum in the world. Happy Birthday! You laid a strong foundation for me and for that am forever grateful. As you turn 40, may you continue showing us the way. Happy birthday, mama. This is the right time for me to express how grateful I am to have you as a father. Thank you for always guiding me. Happy 40th birthday daddy. To the best father in the universe: thank you for always sacrificing all you had for me. I would not be where I am without your guidance and protection. Happy 40th Daddy! You are getting better as you grow old. For you, 40 looks more like 20. Happy birthday to the best dad in the world. I always count myself lucky for having such a great dad. Now that you are turning 40, my only prayer is you live many more years to continue being a great dad. Happy Birthday. This is the one special day for everyone in the family. You turning 40 is a significant milestone which we all should celebrate. Thank for being a great pillar of this family. 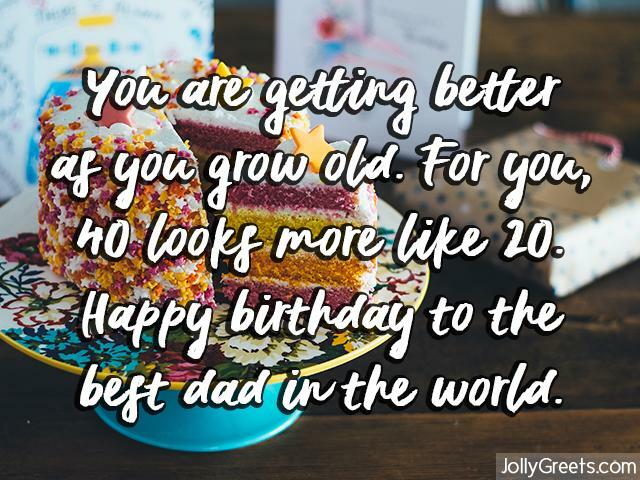 Happy Birthday, Dad. Am always thankful for bringing up such a strong woman. As you turn 40, keep teaching your kids the most important values in life. Happy birthday my sweet daughter. Well, life begins at 40. It is time you start focusing on the essential things in life and growing your family. Happy birthday to my one and only son. You are midway to 80, and you still look 16. Way to go my daughter. May you live to become a more responsible woman and mum. Happy birthday! May the Lord be with you as you celebrate achieving this special milestone in your life. Happy 40th Birthday. 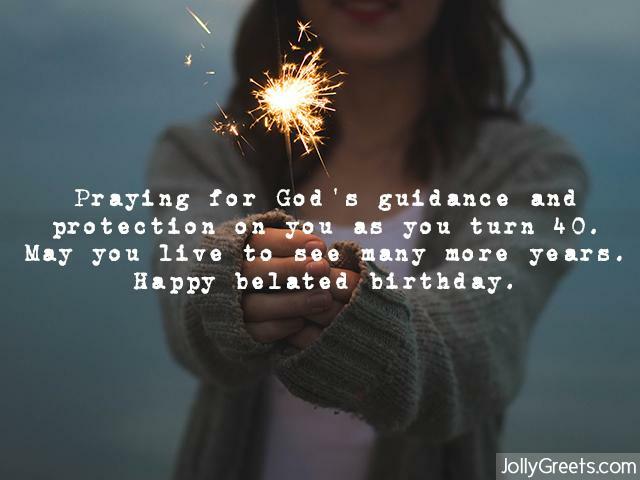 Praying for God’s guidance and protection on you as you turn 40. May you live to see many more years. Happy belated birthday. Jesus will light up your birthday with his glory and blessings the same way he has done it for the past 39 years. May you live to continue worshipping the Lord. Happy birthday, dear. Making God your priority and part of your everyday life is what inspires me. God’s blessing has been with you throughout the years until now when you are turning 40. Have a fantastic birthday full of God’s blessings. Having the opportunity to work with you is one of the best things to happen in my life. Seeing you reach 40 looking so young is another good thing. Happy 40th mate. It’s always fun working with you because you make everything seem so much easy. May your 40th birthday be of great fun. Thank you so much for believing in me and giving me the opportunity to work with you. Happy 40th birthday sir. Working with you is one thing am always thankful about. You teach me new things each day and correct me whenever am going wrong. 40 is an exceptional age, and it’s great to see that you have accomplished a lot at that age. May you enjoy your special day and live to see many more. Happy birthday, boss!